Researchers developed an alteration to the lithium-sulfur battery that could make it more than competitive with the industry standard lithium-ion battery. The lithium-sulfur battery, long thought to be better at energy storage capacity than its more popular lithium-ion counterpart, was hampered by its short cycle life. Currently the lithium-sulfur battery can be recharged 50 to 100 times — impractical as an alternative energy source compared to 1,000 times for many rechargeable batteries on the market today. The shuttling of polysulfide ions between the two electrodes of a lithium-sulfur battery is a major technical issue that limits the electrical performance and cycle life of this battery. This “polysulfide shuttle” causes self-discharge, low charging efficiencies, and irreversible capacity losses. Suppressing the polysulfide shuttle will bring us closer to realizing a rechargeable battery that has two to three times the energy density of today’s lithium-ion batteries. We demonstrate a novel approach to the problem of the polysulfide shuttle by using a “mixed conduction membrane” (MCM). The MCM is a thin non-porous lithium-ion conducting barrier that simply restricts the soluble polysulfides to the positive electrode. Lithium-ion conduction occurs through the MCM by electrochemical intercalation or insertion reactions and concomitant solid-state diffusion, exactly as in the cathode of a lithium-ion battery. Because of the rapidity of lithium ion transport in the MCM, the internal resistance of the battery is not higher than that of a conventional lithium-sulfur battery. The MCM is as effective as the lithium nitrate additive in suppressing the polysulfide shuttle reactions. However, unlike lithium nitrate, the MCM is not used up during cycling and thus provides extended durability and cycle life. 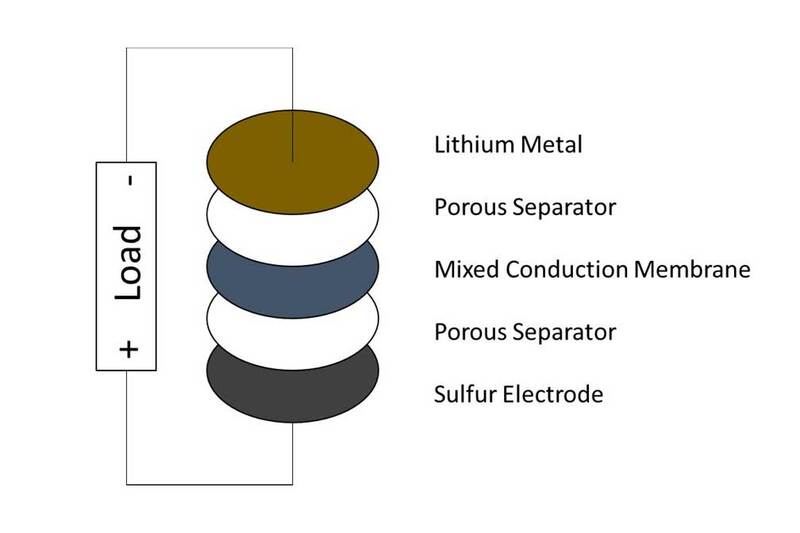 We establish the criteria for the selection of materials for MCMs and demonstrate the effectiveness of this novel MCM layer by proving the suppression of shuttling of polysulfides, demonstration of improved capacity retention during repeated cycling, and by the preservation of rate capability and impedance of the lithium-sulfur battery.